The Daily Mail reports that people are flocking to support Duck Dynasty star Phil Robertson after the network, A&E, placed him on indefinite suspension from the hit show after executives at the network took issue with remarks he made in an interview with men’s magazine, GQ. A network publicist accompanied him to the interview, but was not present when he made the remarks, called ‘homophobic’ by some. Still, Robertson’s views were well-known to the network and their censure seems likely to be designed to garner media attention and pander to a tiny vocal leftist minority. Indeed, a consumer backlash over the suspension has driven massive sales of Duck Dynasty branded merchandise at Walmart in support of the Robertsons. Action to take: Ironically, financial support from buying merchandise also benefits A&E to a large degree. Really want to tell A&E what you think? Share this article and use the contact information below to communicate with A&E directly! Freedom Of Speech.You dumb Asses at A&E. Because of A&e decision to blackball duck dynasty I refuse to support A&e and will no longer watch any shows in their network. 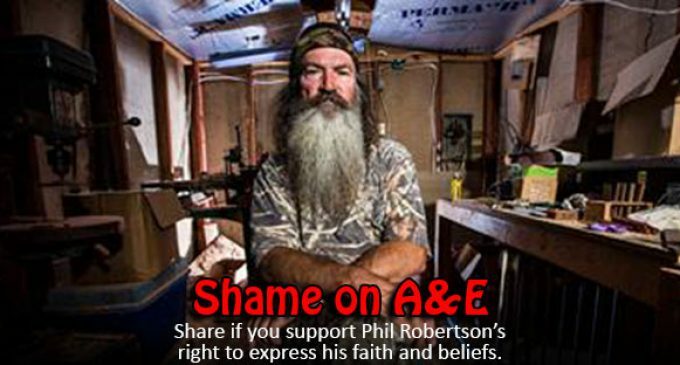 If the A&e network makes this right with Phil Robertson then and only then will I go back to A&e . 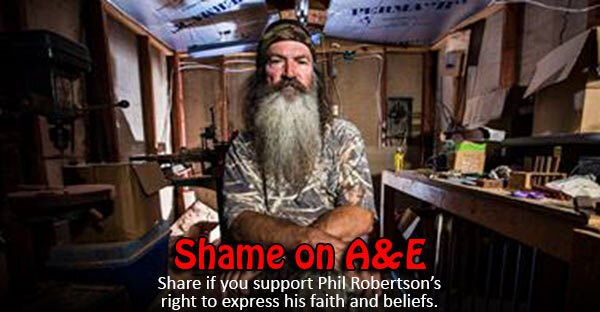 I am appalled and ashamed of a&e’s decision.